Ants are moving their nests to high ground and are moving to places where they have never been before, even before the 2011 floods. Look to the ants i say! Well look at the glorious blueage on the animation. Interesting Spring result despite the Indian Ocean not playing ball. Wettest Spring on record locally . Far more blue on that map than red. Wet winter for some. Meant to say wet Spring for some. 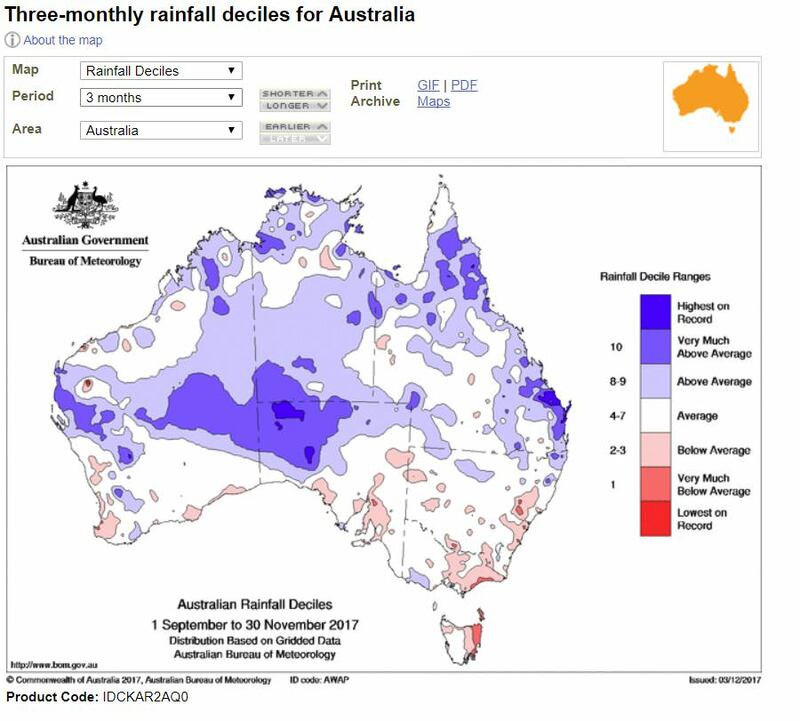 CFS has a wet signal lasting into autumn now. Looks like the trades are going to ease a little according to GFS, but then that could be due to the MJO which is going to grind according to the current forecast to a halt in the western Pacific. CFS is all over the place at the moment, another thing to note is that the monsoon is still in the northern hemisphere which will delay the onset of the wet season up north. The effect of the persistent easterlies have really left their mark on the SST in the Tasman. Looks like a severe marine heatwave. And yet the never-ending persistent ridge of High pressure remains, and so does the drought over this area. No sign of La nina here yet. Surely warm water like that would help shift the pressure systems. Once upon a time troughs commonly dipped down the coast almost exactly the opposite of this stupid ridge that races up the coast to QLD every time a front passes. This ridging has happened across all seasons for seemingly years now. Where are the highs with straight long fetch easterlies onto the coast of NSW? They just dont happen because this triangle shaped ridge all the way to QLD is always replacing the previous HPS (the same ridge that steers all the cyclones away SE). Where did all he coastal storms go in Eastern NSW? I loathe this stupid pattern. I want whatever climate driver that put it there to switch and wipe it out for good. The warm kelvin wave is now at 120W and approaching the eastern edge of the Pacific, which is when they have the strongest warming impact on the surface. Strongest westerly wind burst so far, and forecasts suggest it getting stronger. 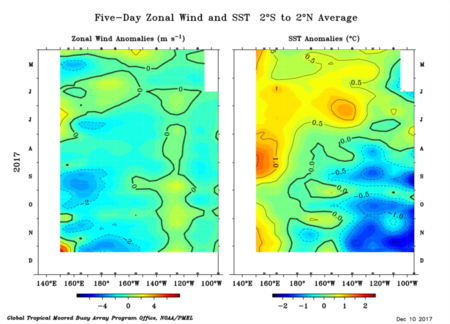 Peak westerly anomalies are nearly twice as strong as the peak easterly anomalies at the moment, although over a smaller area. The strength of the current WWB is comparable to the initial WWBs for both the 1997 and 2015 el ninos, although in both cases they were followed up quickly by stronger WWBs. La Nina conditions were called by BOM for nino 3 being below -0.8, and it has risen again to be -0.81, the third week below -0.8. 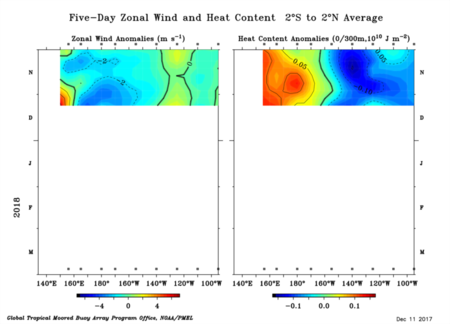 Short term with the Kelvin wave and the strong WWB it seems further warming is likely. Longer term CFS is the only model showing any further cooling in the forecast with other models holding current intensity or warming from the start of next year. Yes, it is a pain in the arse for many areas. The "quidge" it is sometimes called in Qld (Queensland ridge) . The Indian is looking ugly, it just does not want to warm up. This is as bad as its been since August/September. That depends on who's map you use Johnno. Can Mt Agung eruption locally impact the ssts off Indonesia? Cos none of the models have picked up on this sudden cooling again in this area by now ALL climate models showed warmer than normal ssts through this area by December. Yeah Unisy has it too CF but sort of in between WZ and your map so I'm not sure what to believe at the moment. That UNISYS map looks nothing like the NOAA one? 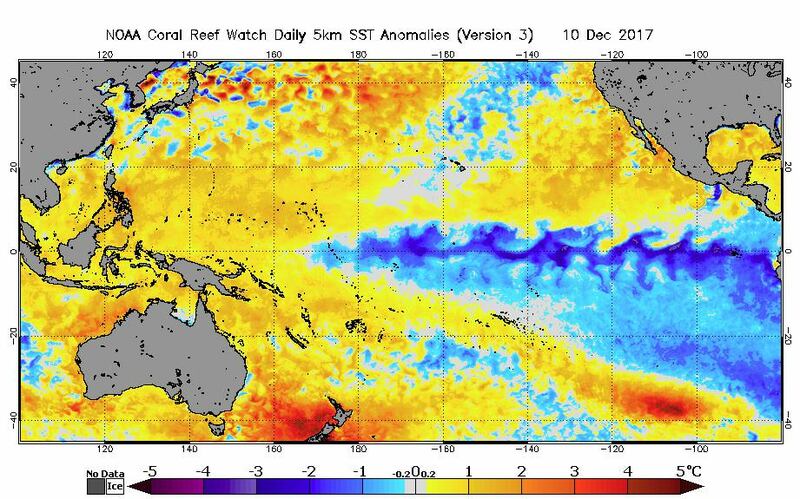 There are no warm patches in the eastern South Pacific? POAMA and CFS both picked the cooling for later this yr earlier this yr than any other model and now both models are looking very cool well into 2018 so it wouldn't surprise me the double dip or even triple dip if you include 2016. Latest UK into May still has temps around -0.7c/-0.8c which updated yesterday. EC on the other hand which was the last model to back away from the warming for later this year has temps back to neutral near 0 by May.. Tends to over estimate warming IMO. My personal view is that the unysis map is not worth a pinch anymore. It used to be my go to until they changed sources a few years back. It is virtually impossible to have so little neutral temps outside of Antarctica . Prior to the change the neutral range made up around 15-20% of the surface area which is far more logical. Note the different scales as more extreme conditions were achieved in the 97/98 event. 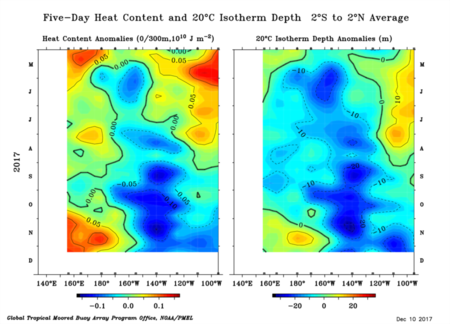 Similar size WWB, similar size western warm pool, so should be similar sized warm kelvin wave. 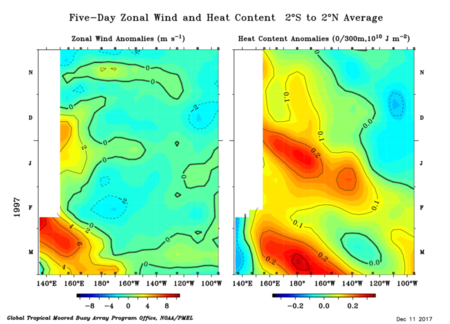 When the first kelvin wave hit the east Pacific in March 97 the cool surface was replaced by warm anomalies that were then consolidated by the much stronger WWB occurring at this time. More subsurface cool water now, but at the surface at the end of the 96 there was a similar surface cool tongue that was a bit weaker, but extended further west. The enhanced trade winds towards the central Pacific now may make some difference, but I'd expect they'd act more to slow the Kelvin wave down after its generated rather than impact the initial generation. Generated in 0.068 seconds in which 0.045 seconds were spent on a total of 14 queries. Zlib compression disabled.